We recently hosted friends for a casual Fall-inspired dinner. I don't know about you, but my favorite way to entertain in the Fall is by serving big, warm pots of soups, stews, and chilies FAMILY STYLE . . . rustic loaves of fresh breads . . . all in a comfortable, Fall-inspired setting. For our Fall evening gathering, I served Farro & Sausage Stew and Artisan Rosemary bread FAMILY STYLE on our kitchen island. I stacked white bowls, linen napkins, and spoons on a large wooden board for ease and convenience. 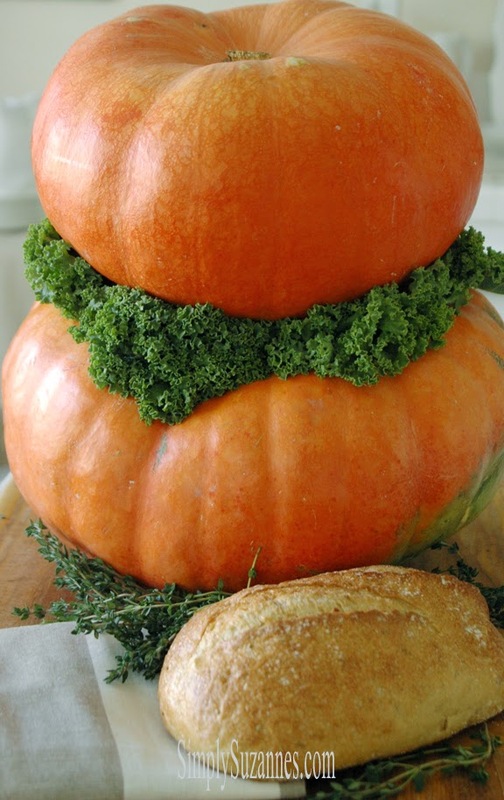 And to create a fun and festive setting, I stacked a few of beautiful Cinderella pumpkins, and then tucked kale between them . . . for a sort of kale collar (say that 5 times!). I had extra fresh thyme and rosemary, so I placed a few bunches here and there around our food, and it smelled heavenly. Here's a peak at our evening . 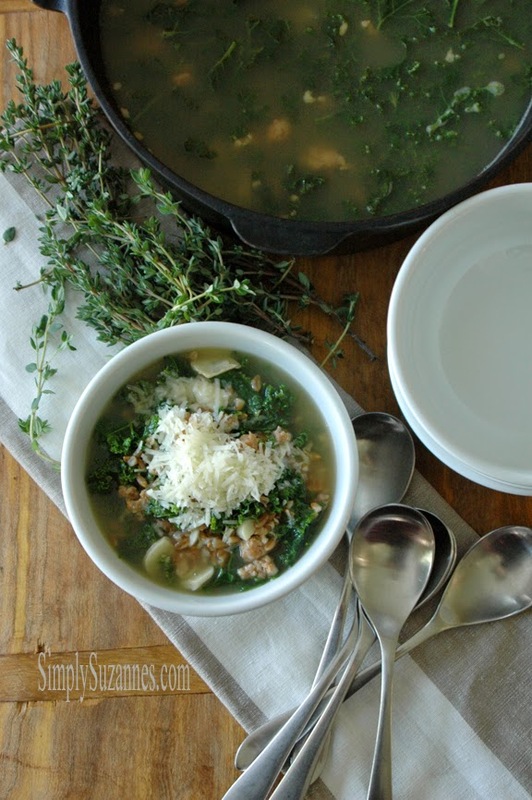 . . and a recipe for a delicious Fall and Winter soup! 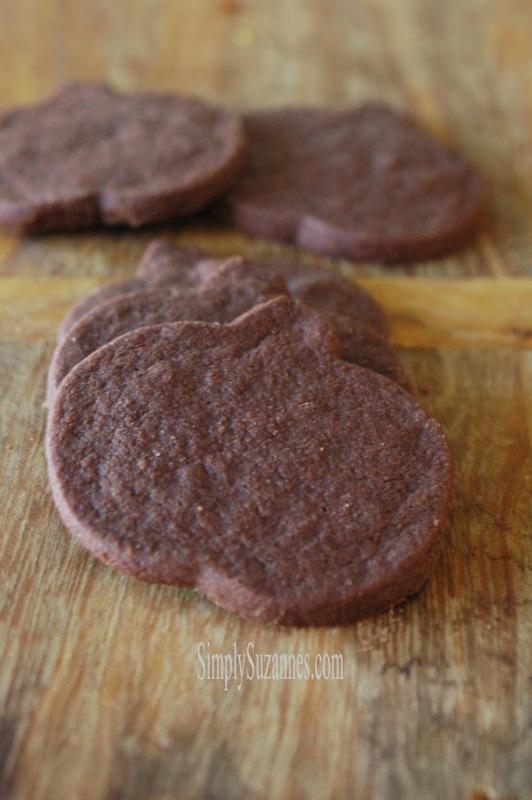 These chocolate short-bread cookies are so good. They taste a lot like French Chocolate Sables . . . yum! We enjoyed them with pumpkin ice cream after dinner. I hope to share the recipe soon! I've shared a few of my favorite soups and chili recipes on this blog, like here, here, and here . . . and I have a new one to share with you today . . . farro & sausage stew! 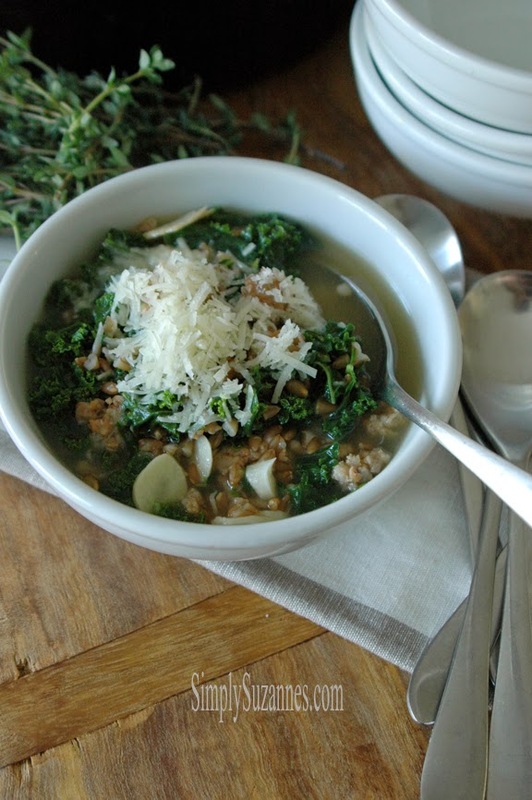 Whole-grain FARRO is the star of this hearty soup. Have you ever tried it? It's a wheat berry that's high in fiber, protein, and nutrients. It's nutty and full-flavored, with an appealing chewy texture. 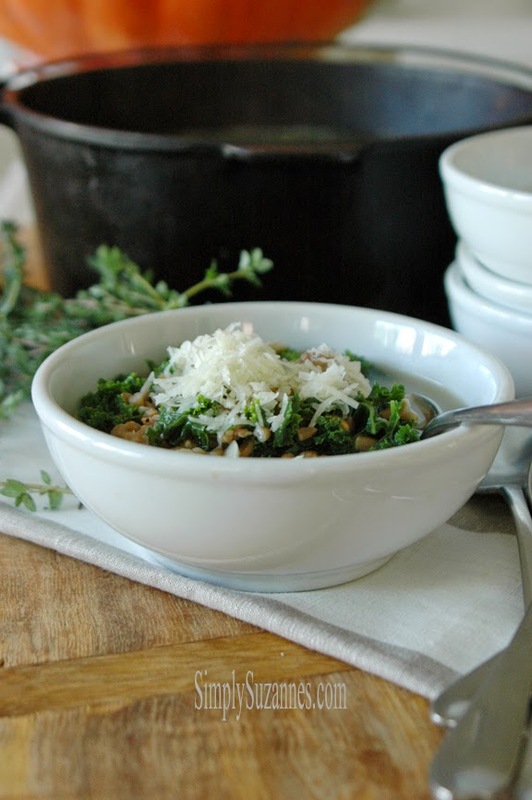 FARRO certainly gives soups and stews a 'hearty' factor. Fine Cooking shared great nutritional information on this ancient variety of wheat, here. Since it can be somewhat hard to find, I want to share two sources that might help you find this WHOLE-GRAIN wonder . . . .
Bob's Red Mill is a brand commonly seen in most markets now, and sells packaged FARRO for approximately $5.49/bag, OR . 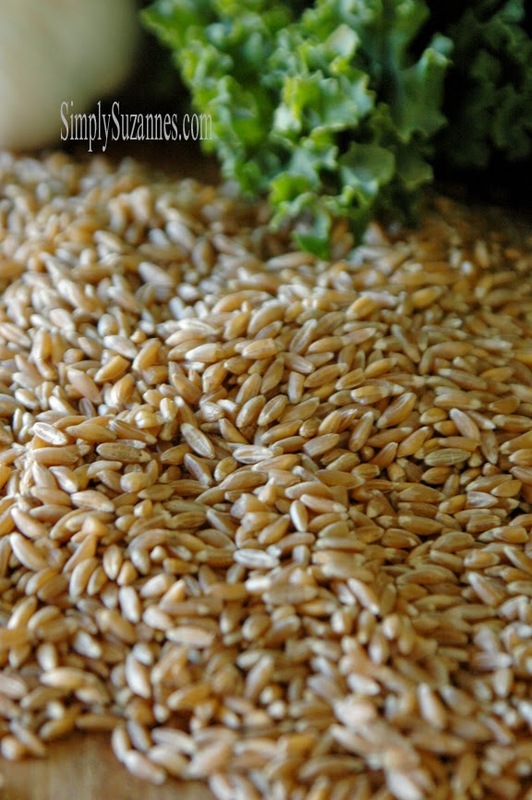 . .
you can also find WHOLE-GRAIN farro in the bulk buy bins section in your market. I prefer to buy it this way, since I don't cook with it very often. Buying from bulk bins also allows you to buy smaller quantities, which is great . . . and costs less, too. I can buy 3 cups of FARRO for approximately $2.25. Please note that this recipe calls for WHOLE-GRAIN farro, not pearled. I chose to use whole-grain because it's more nutritious, but with that extra nutrition comes a LONGER cooking time. So let's talk about this soup . . . stew . . . Besides that it's full of healthy ingredients, it's also a delicious, clean-tasting, and hearty. The spicy Italian sausage adds a little punch of heat . 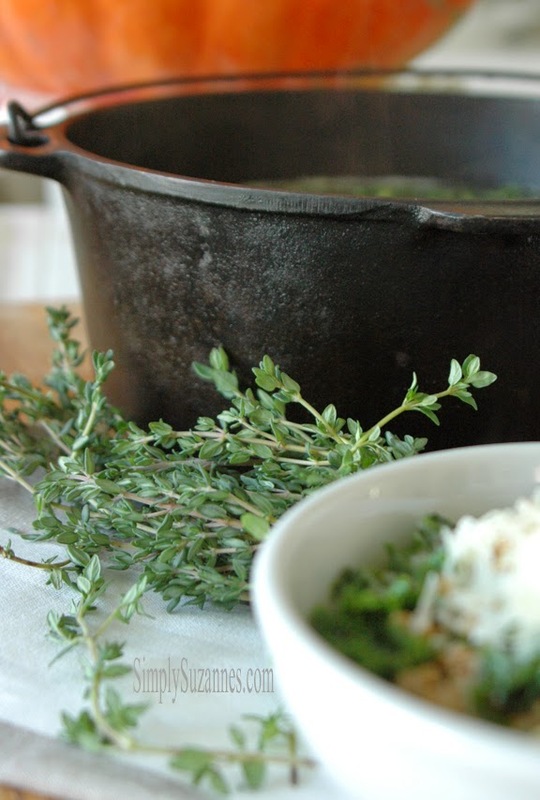 . . the kale and fresh thyme gives freshness . . . and the FARRO - a yummy, chewy nuttiness. The combination yields a delicious and healthy soup. Another thing that made this soup/stew extra special was that I used home-made broth. You can see my recipe for it here. Oh my heavens, and adding ribbons of shaved fresh pecorino-romano takes it to a whole new level of creamy yumminess! A must when you make this soup! In a large, heavy saucepan, cover the farro with a couple inches of water. Cover and bring to a boil. 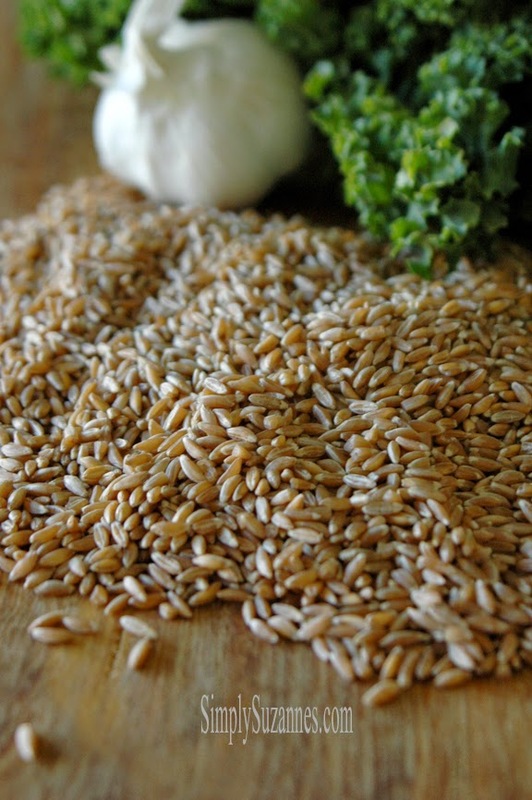 Reduce the heat, salt the water and simmer gently until the farro is tender, about 30 to 40 minutes. Drain. Meanwhile, in a large saucepan, heat 1 Tablespoon olive oil over medium heat. Cook the sausage, breaking it up, until browned, about 5 minutes. Transfer to a plate. Cook the garlic until golden, 2 minutes. Add the stock; bring to a simmer. 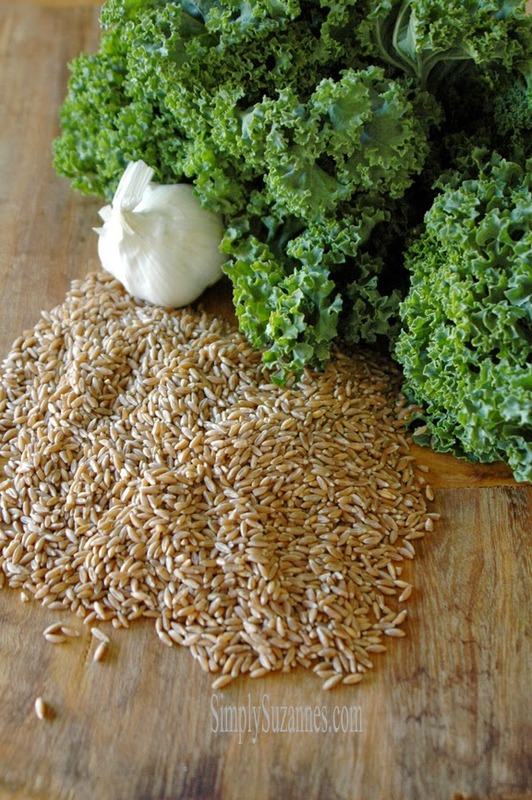 Stir in the farro and kale and simmer until the kale is tender, about 8 minutes. Remove from heat. Return the sausage to the pan and stir in the thyme. Season with salt and pepper. 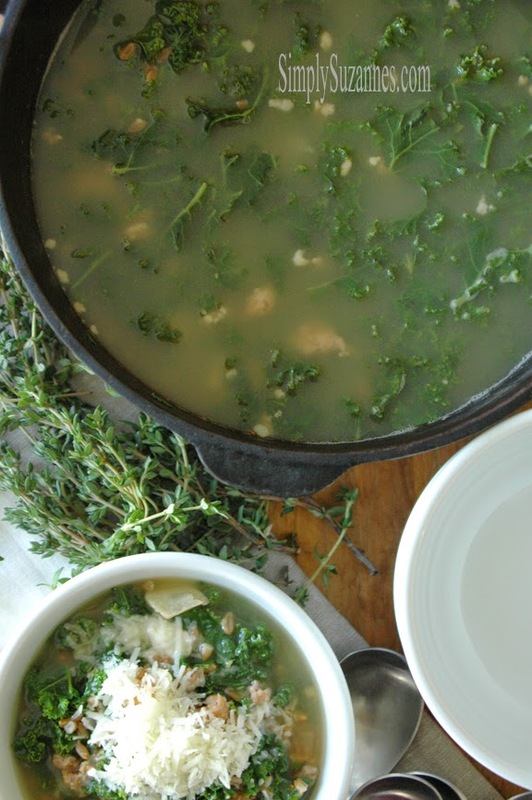 Divide the stew among bowls, top with the shavings of pecorino-romano and drizzle with olive oil. Cheers, to cozy Fall evening with friends! I've only had faro once and found it to be delicious. I'm not sure why I haven't cooked with it since, but this recipe will change that. Mr. B. and I love soups and stews in the fall/winter months. 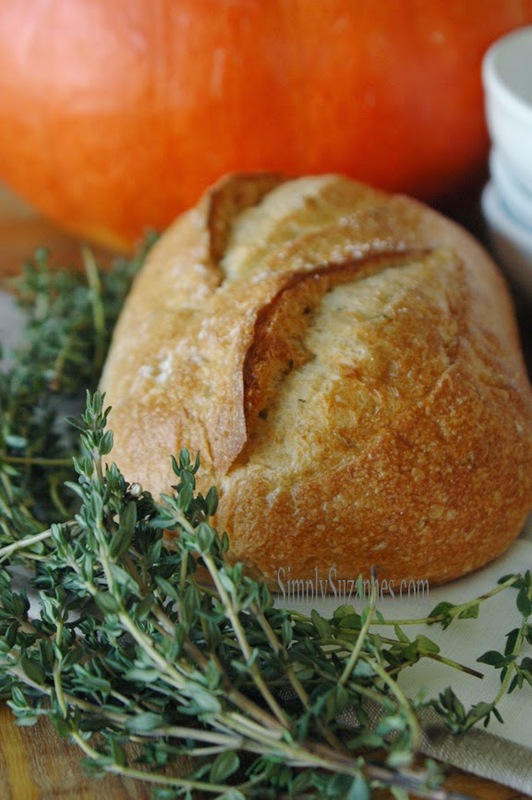 Great crusty bread is always the side that completes the menu. Wow-this is my kind of cooking, especially in the fall. I recently hosted a 'soup night' at my house for a crowd and it was wonderful. Had I seen this recipe prior, I think this just might have made the list of soups being served. I love your blog by the way--your pics are always so inviting and make my mouth water!! This looks and sounds marvelous! And your pictures are gorgeous...going to have to guve this one a try. Thank you so much for sharing! Can I come to your next party? Your guests must feel so special. What a wonderful meal and such a pretty way of presenting it! We are a soup lovin' house and this is something all five of us would be on board with. Yum, yum. I've only cooked with farro once, but really liked it, so it will be fun to have a new recipe to try it in again. Any grain is yummy in my book. Thanks for sharing. And, as always, your photos are so beautiful. Looks wonderful! I just adore soups this time of year. Sounds so yummy and your images are beautiful! You had me with the herbs. Your photography is gorgeous. Can I ask what camera and lens you are using? I love your photographs! 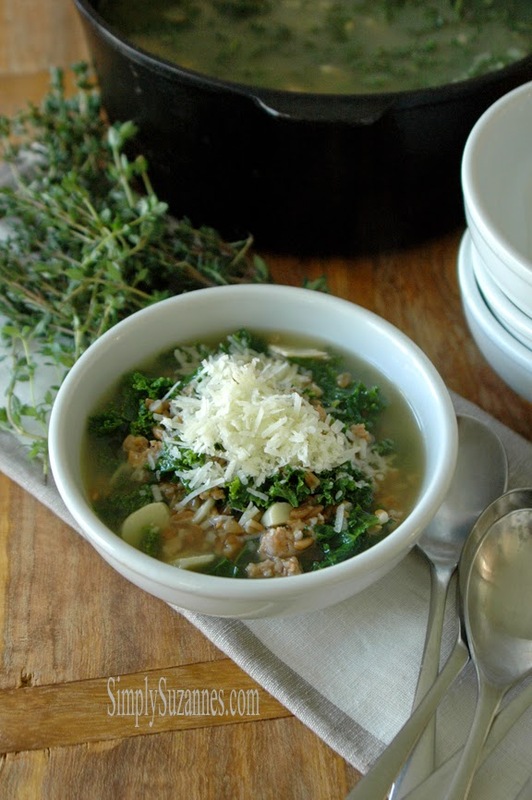 I have never had farro, but it definitely looks delicious in this beautiful soup. I have never worked with farro before, but this looks absolutely delicious. The kind of soup I could warm up with on a cold winter night. I've never heard of farro before, but this soup looks delicious. It's a cold blustery night here, wish I had a bowl right now! Thanks so much for linking up to Teach Me Tuesday last week. You are very much appreciated. Starting this week, we will no longer be visiting you, instead we will be pinning each and every link. We want to give you more exposure! Hope to see you again this week!! Beautiful photos! Looks so good! Thanks for sharing!